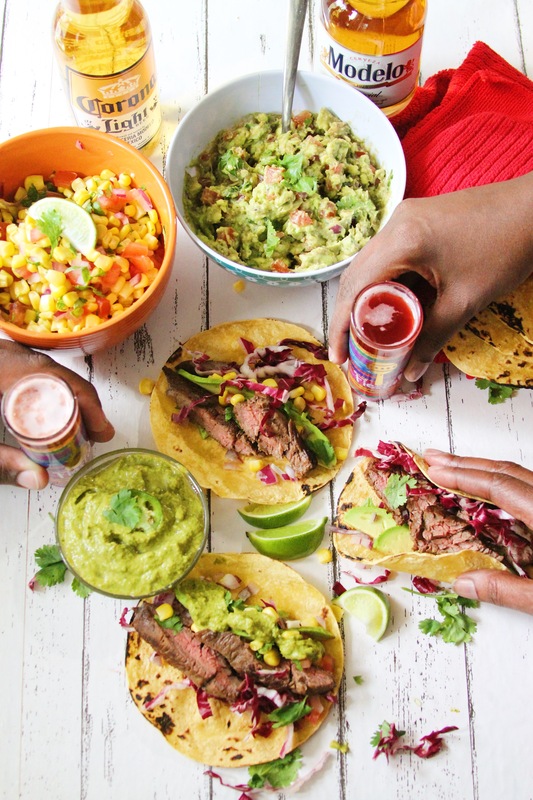 Home Food & Entertaining Food Cinco de Mayo Fiesta with Corona & Modelo! Good morning guys! I’m so excited to share another recipe with you! Well, in this case, it’s more like 3 recipes lol. I’m prepping early for one of my favorite holidays Cinco de Mayo!!! My friends and I always celebrate by going out to the bar to drink margaritas but this year I’m switching things up! 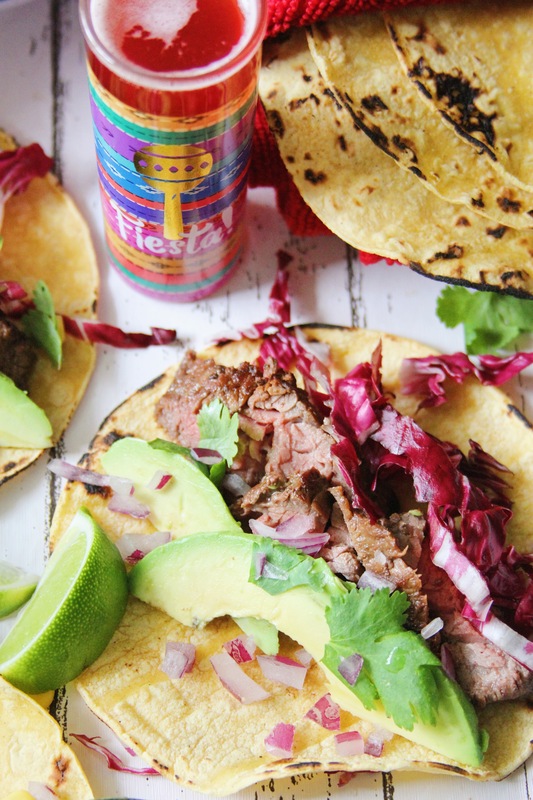 I’m hosting a party at home with a couple of drink recipes and some amazing skirt steak tacos! All three recipes will feature my top 2 beers Corona and Modelo! 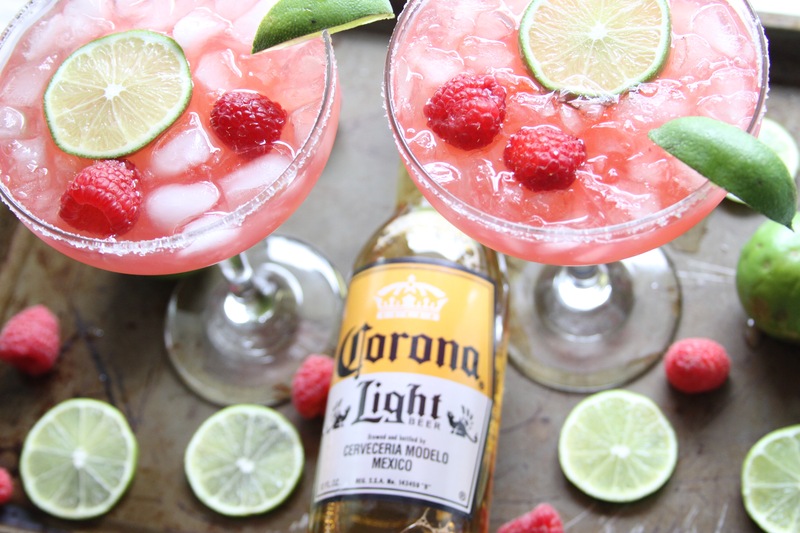 I’m definitely a Corona Light w/ lime girl so it was a no-brainer to incorporate both beers into my recipes. So let’s get ready to jump right in! I’m making Raspberry Lime Beergaritas, Tequila Beer Shooters, and Jalapeño Lime Honey Beer Skirt Steak Tacos, with a Spicy Cilantro Salsa! I’m also serving my classic guacamole and corn salsa! 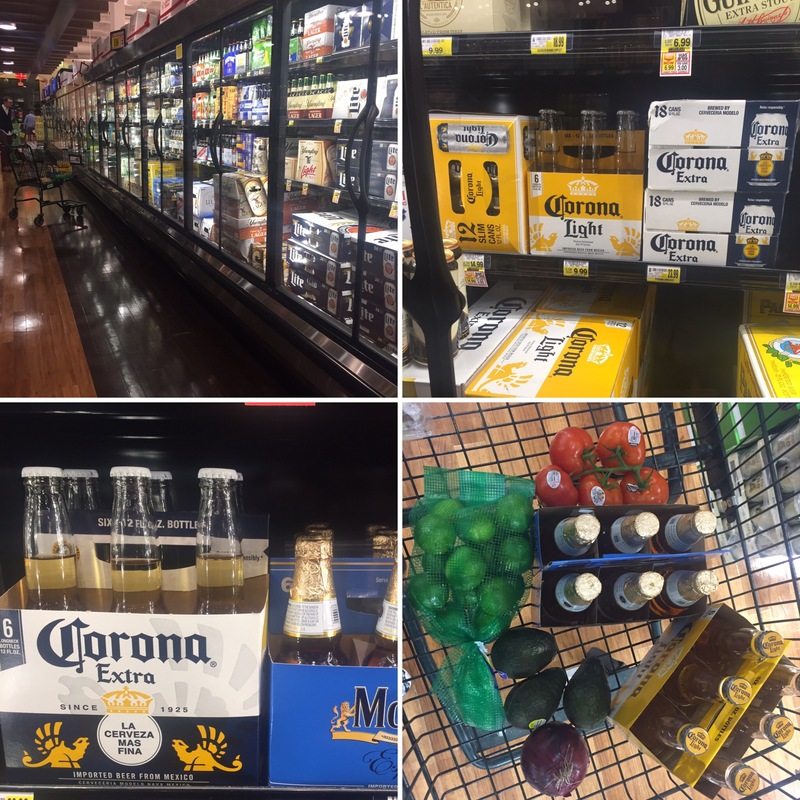 There are a few things I love about drinking Corona Light! Firstly it’s ONLY 99 calories – always an incentive! Plus it has a smooth taste and pairs well with spicy and citrus infused dishes. Modelo is another go to drink for me! I love the smooth taste that also pairs well with a slice of lime. I know it seems like A LOT but trust me it’s all super easy to make! You can even prep things the night before or the morning of to make things super simple. Let’s get started with the Raspberry Lime Simple Syrup….first take 2 cups of frozen raspberries, the juice of 1 lime, and 1 cup of sugar into a small pot. Bring to a boil and stir until the sugar completely dissolves; separate the seeds and pulp from the syrup with a mesh strainer. Set aside and allow to cool. Next, let’s make our marinade! 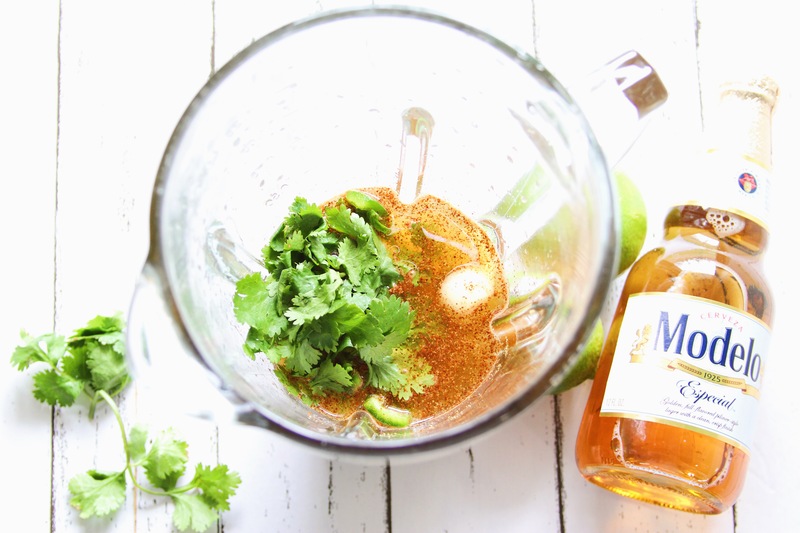 Add your Modelo Beer, honey, lime juice, chili powder, cumin, garlic clove, cilantro and jalapeno to a food processor or blender. Blend it until we well combined. 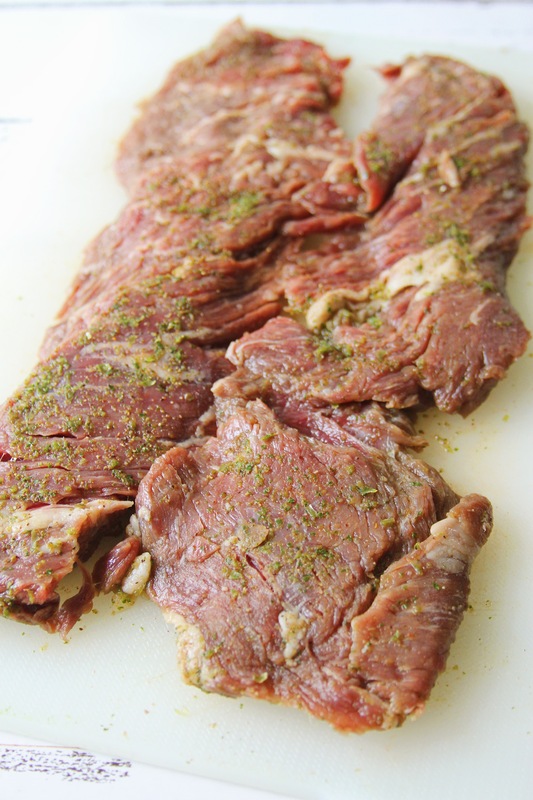 Next season your skirt steak with salt and pepper….maybe even a seasoning blend. Rub the seasoning into the meat then cover the meat completely with the marinade. Cover with plastic wrap and place in the refrigerator for at least 1 hour….if you’re a regular reader you know I always prefer to marinade my meat overnight lol. 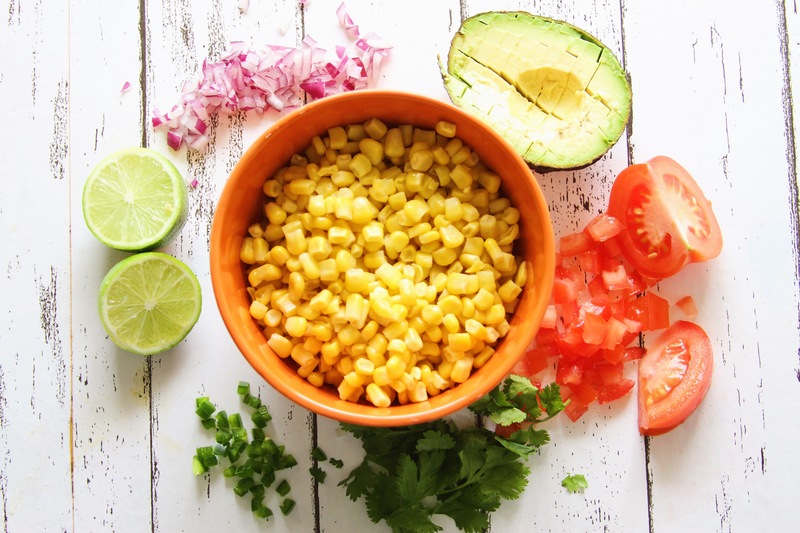 Once your meat is marinating in the fridge you can start working on your guacamole and corn salsa. I make things super easy with the salsa by buying a frozen bag of yellow corn and pre-cut red onion! After that, you just need a squeeze of lime juice, Diced tomato, cilantro, salt, and pepper to taste. 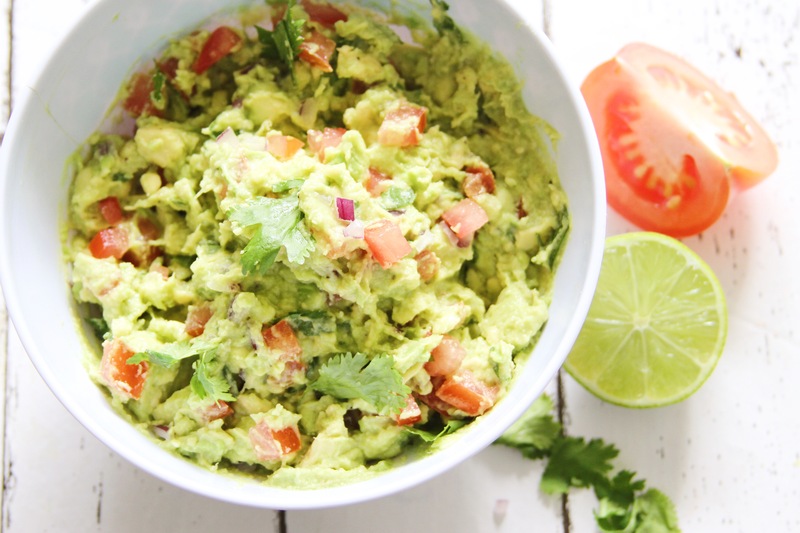 The guacamole recipe is also super easy to make just check out my recipe here! Let’s start on this Spicy Cilantro Salsa! Which btw is also super easy to make! 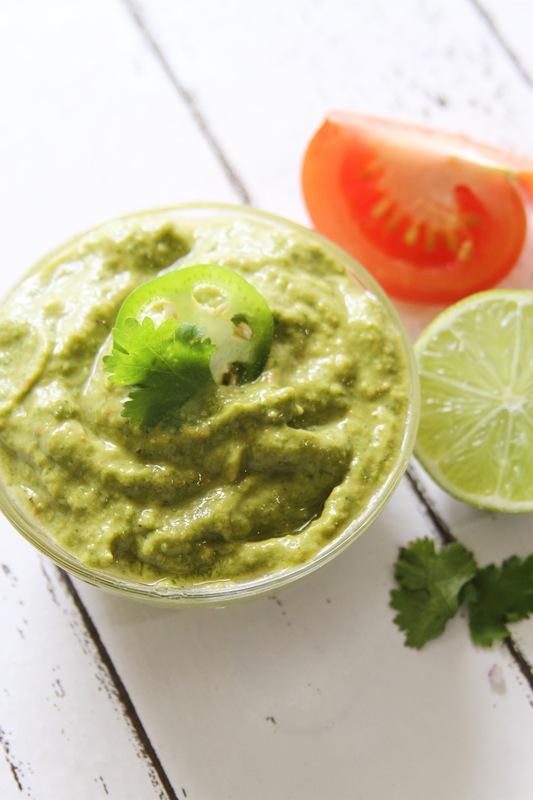 Just blend a bunch of cilantro, 1 tomato without the pulp, olive oil, lime juice, and avocado! 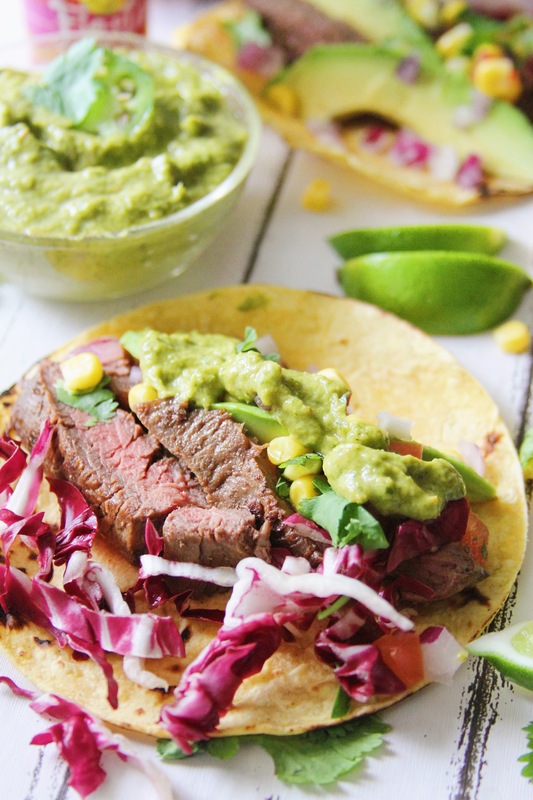 This recipe is super delish…I even recommend popping a small garlic clove for extra flavor. 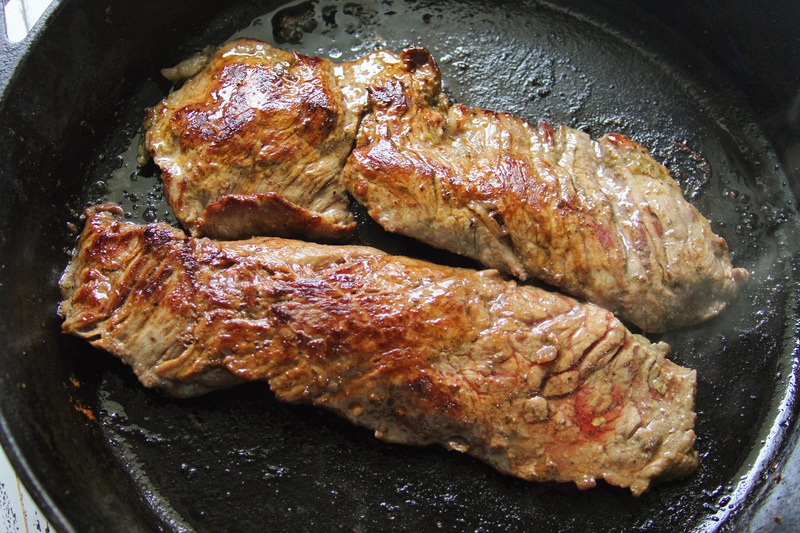 Once your steak is done marinating pop those babies on the grill or you can cook them in a cast iron skillet like me! I plan on grilling for Cinco de Mayo because I’m sure the weather will be perfect! Now let’s get started on our shooters and Margarita!!! I ended up making a pitcher of Margarita because you can never have too much Margarita! lol it’s super easy to make and I promise everyone will love it! Same with the shooters they are literally only 3 Ingredients! See full Ingredients and instructions below. 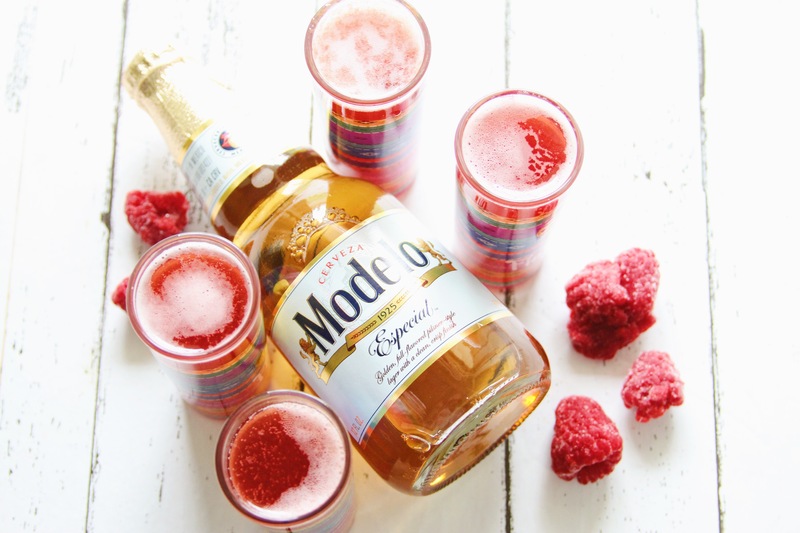 Cinco de Mayo Fun w/ Corona & Modelo! 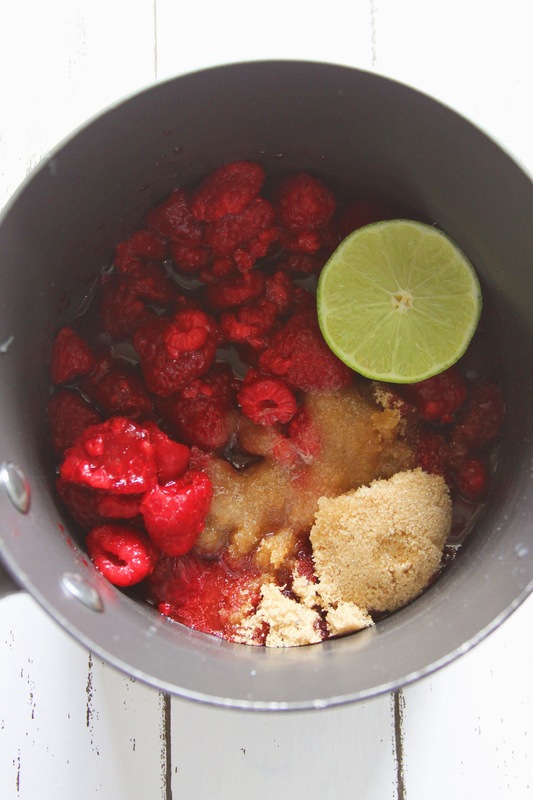 Add sugar, raspberries, and lime juice to a small pot of water. Strain the seeds and pulp with a mesh strainer. 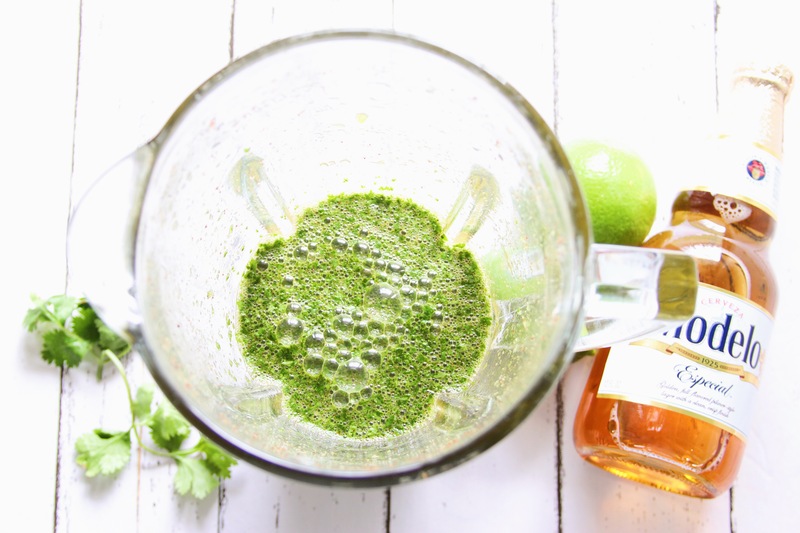 Blend until ingredients are broken down and mixture is well combined. 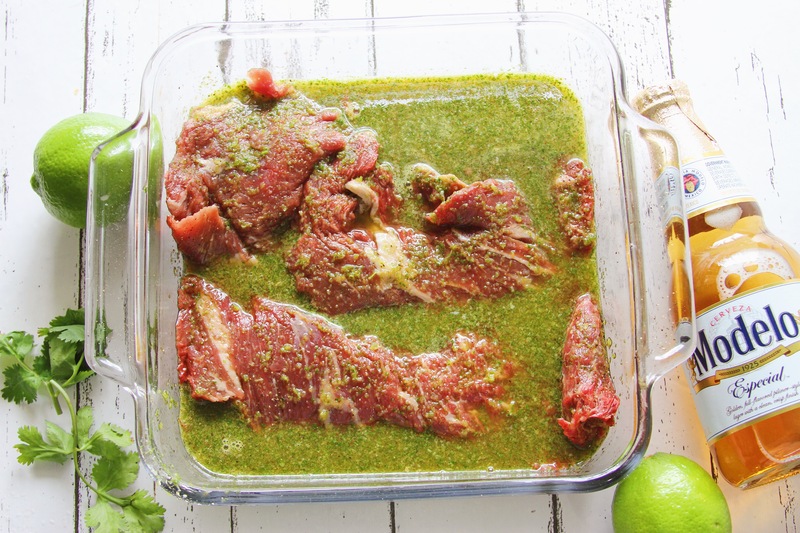 Add to your seasoned skirt steak; add plastic wrap and place in the refrigerator for a minimum of 1 hour. Use a strainer to rinse corn until thawed. 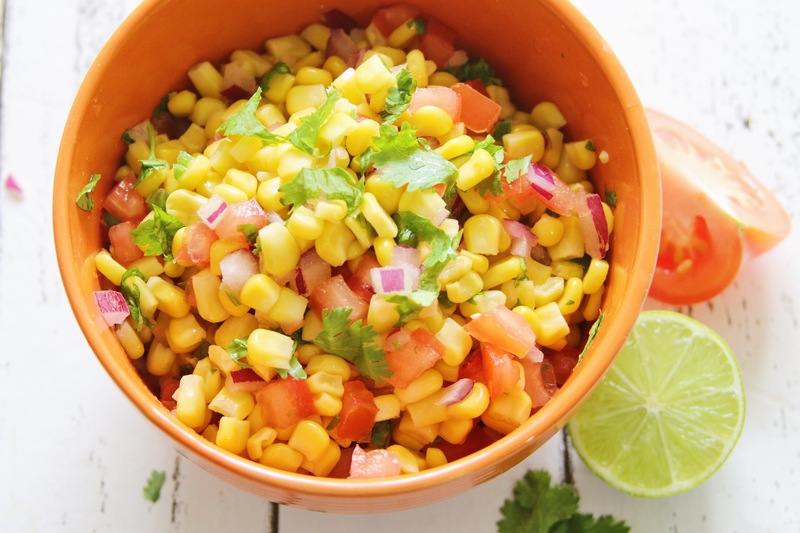 Add corn, chopped red onion, Diced tomato (no pulp), lime juice, chopped cilantro, salt, and pepper. 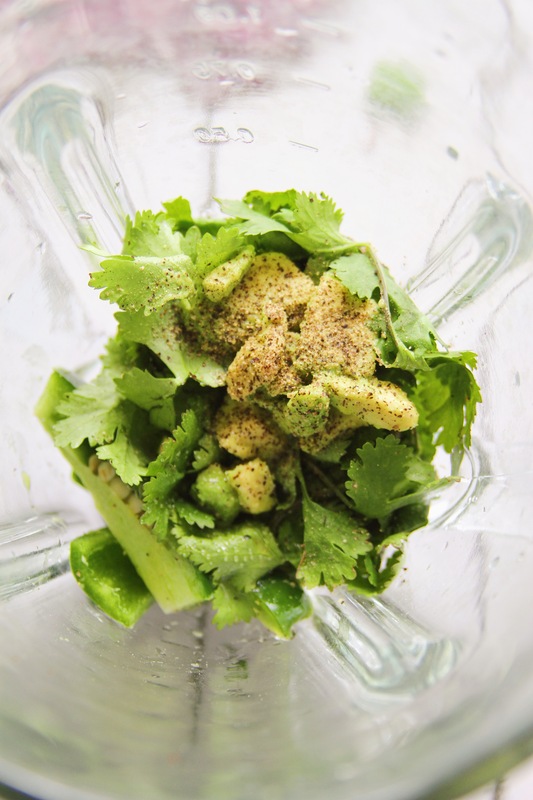 Add jalapeño, olive oil, lime juice, salt, pepper, cilantro, avocado, and tomato to a blender. 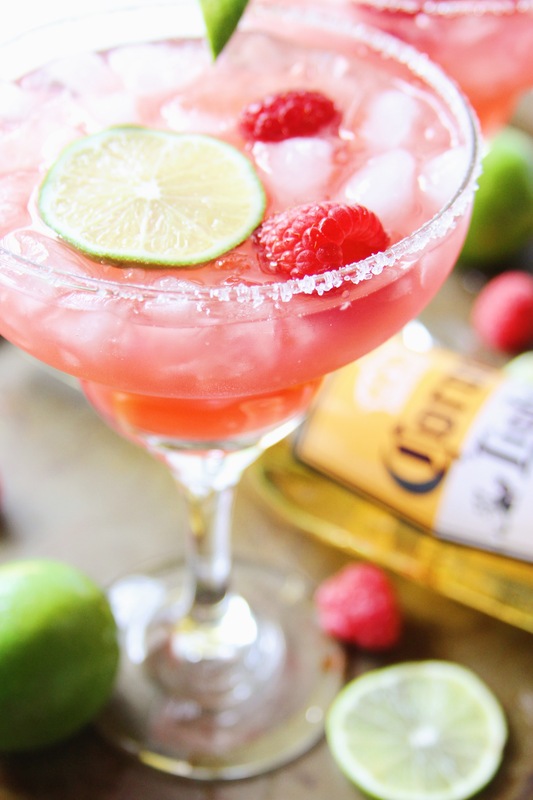 Add tequila and raspberry to a shaker with ice and shake until chilled. Add to a shot glass and top with Modelo. 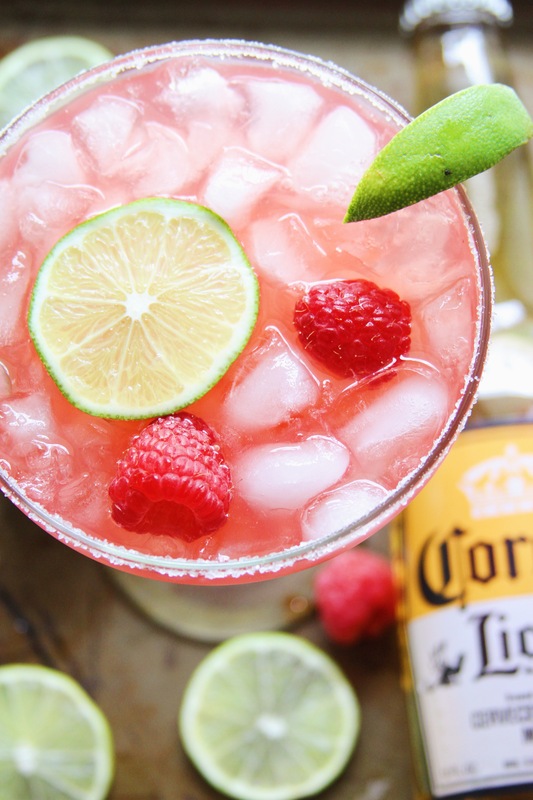 Add limeade, water, juice of one orange, Raspberry Simple Syrup, tequila, orange liqueur, Corona Light, juice of 1 lime. Add limes slices and raspberries to the pitcher give everything a good stir. Place in the refrigerator and let chill for 1-2 hours before serving.